Wittenborg Online: Wittenborg Amsterdam Business School Students also Graduate at University of Brighton! Wittenborg Amsterdam Business School Students also Graduate at University of Brighton! Double degree? Wittenborg Amsterdam business students show the way. A year of 'hard academic graft' has paid off from Wittenborg's business school students from Amsterdam who have completed the joint degree programme BBA in Entrepreneurship & Small Business and BSc in Business & Management. 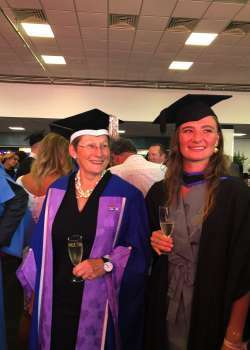 Hats off to double degree graduates from Wittenborg Amsterdam who attended the University of Brighton's Summer Graduation Ceremony on Friday where they received their diplomas. Seven students from Amsterdam graduated with a double degree this summer - an IBA (Bachelor) in Entrepreneurship & Small Business from Wittenborg and a BSc (Hons) in Business & Management from the University of Brighton in the UK. They represent the very first graduates from Wittenborg Amsterdam which opened its doors in 2015. Three of them attended the Brighton ceremony on Friday - Manuel Braakman, Graziella Prins and Maria (Maru) Lizarraga - at the Brighton Business School. They were supported by Wittenborg's chair of the executive board, Peter Birdsall. Wittenborg's own graduation ceremony was held in mid-July. Students were also congratulated by Senior Lecturer Clare Millington, who is programme coordinator from Brighton for the BSC side of the double degree. The vice-chancellor of the University of Brighton, Prof Debra Humphris, welcomed graduates and said "this is an amazing day for everyone". Later, the VC specially went over to the Wittenborg graduates to congratulate them in person.